Recap: Sorata returns home for the new year. Since they have no where else to go he brings Mashiro, Nanami and Misaki with him. 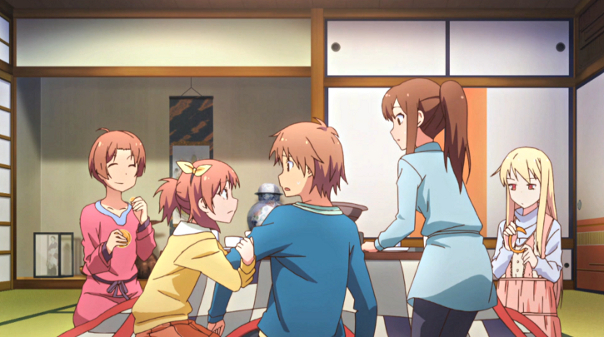 Antics ensue as Sorata’s family picks on him for bringing home a harem. Misaki is still feeling pretty down after getting turned down by Jin. Mashiro, confused by the situation between Misaki and Jin, confronts her about it. After recognizing that she can’t give up being who she is in order to love Jin she decides to try getting his attention the same way she did in the first place, by animating one of his scripts. Not even hugging the kitty can make Misaki feel better. Lifesong’s Thoughts: Sorata’s dad is something else. His manly act makes for an interesting contrast between Sorata and his father. That bath scene was terrifyingly funny but at the same time there were words of wisdom is his drunk father’s words. “Opportunity waits for no man!” Sorata’s father also raises the question of which girl Sorata is into, reminding us that a conclusion is drawing near. On that same front Sorata basically told Nanami that he wants to see her hard work vindicated. It’s important to note that her moving home if she fails wasn’t his primary concern. Nanami seems the most likely to get crushed by upcoming events. She may be completely hopeless in love but like Sorata, I also want to see her hard work vindicated. 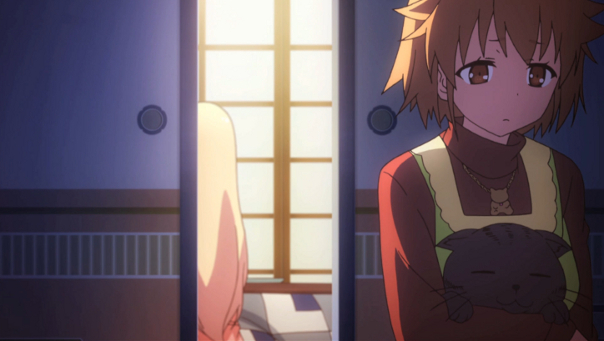 Mashiro was extra cute this episode. I loved the conversation with Misaki and it was good to see her return to her normally energetic self. We know that Jin cares about her and I doubt she will fail this time. Animating Jin’s script seems like a surefire way for Misaki to get through to him and communicate that she understands his worries. I don’t expect it to end on a bad note. We do still have another nine episodes to go before the end. Presumably that is another three to four books of content left to cover. I’ve lost count as to which book we are actually on at the moment. Plan C is still in action. I like the way Sakurasou takes the question of why these characters like each other so seriously. I think it’s important to realize that the nuance of like is not necessarily love even though both words are used for same meaning. It is interesting to note the way that Sorata fell for Mashiro and not for Nanami. Nanami is guilty of giving off mixed signals but the real problem between the two of them is that Sorata never grew attached to her the way he has with Mashiro. There is heart break around the corner for Nanami and right now my question is how it will happen. Will Sorata reject Nanami? Or will Nanami fail her interview and finally be forced to return home? I suspect the later. I hope that I am wrong.